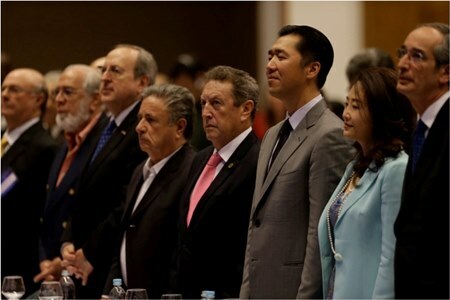 Suk Moon with former heads of state at the Global Peace Convention in Asuncion. (Costa Rica), Eduardo Duhalde (Argentina) and Vinicio Cerezo (Guatamala). More than 3,300 government, civil society and faith leaders from 40 nations addressed peace and development priorities in Latin America and around the world at the Sixth Global Peace Convention in Asuncion on November 19-21, 2014. The first Global Peace Convention hosted in Latin America, it was also the first to bring into focus the Global Peace Foundation’s comprehensive, values-based efforts to advance national renewal though grass-roots social development projects and political reform. The three-day convening, “Roadmap for National Transformation: Liberty, Prosperity an Integrity through Moral and Innovative Leadership,” underscored the importance of shared principles and values and their practical applications in advancing social cohesion and human development. Paraguayan President Horatio Cartes, Vice President Juan Afara, Speaker of the Parliament Hugo Velazquez and fourteen former Latin American presidents joined GPF Chairman Dr. Hyun Jin P. Moon at the historic opening session.